The Gould Riding Academy designed by York & Sawyer for Frank Jay Gould c. 1901 at 217 West 57th Street in New York City. Gould was the son of railroad tycoon Jay Gould. The riding academy was demolished c. 1950. 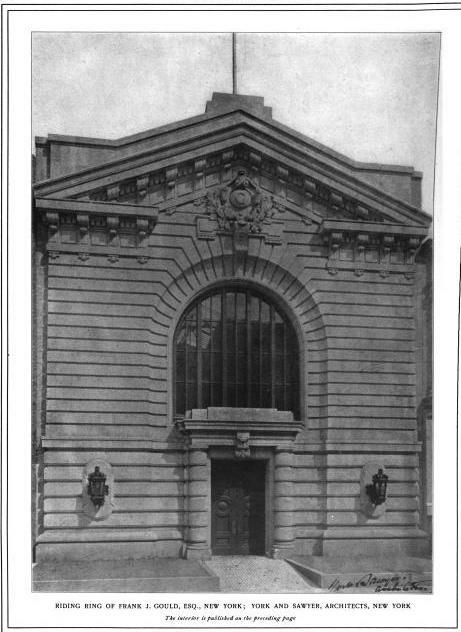 Photos from The Architectural Review, 1902. So, 50 feet of frontage on 57th, and went all the way through the block to 57th, where it had 100 feet frontage. After Gould cannot have enjoyed his expensive luxury for many years, for soon it was used by Tenth Church of Christ, Scientist, and by 1920 M.J. Budlong purchased it, after a long search, as a showroom for Lincoln cars. Six degrees of Trivia---the Budlongs owned the big stone house on Brenton's Point in Newport, which in my childhood stood as a burnt out ruin, with gaunt stone tower.